The InstCube Indicator 1 is a wall-mounting ABS plastic enclosure with Omron E5CC instrument. 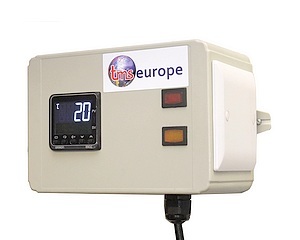 In addition to acting as a display unit, it has two customisable alarms which turn on the red and orange indicator lights and can be used to show the state of the process it is monitoring. The display flashes "ALM" when the unit is in alarm. Its high contrast LCD screen which displays characters 15mm high ensures excellent visibility in all working environments. 2 alarm indicators; red and amber.